Hey kids, gather 'round. I've got something important to share. In Macau, the Vegas of Asia, things are pretty much exactly the same as the original gambling Mecca – lots of people in pyjamas and loads of smoke. The same rules apply too. But I'm going to go out on a limb here, the food is so much better in this ex-Portuguese colony. Suckling pig? Yeah. Weirdly though, there's a rash of restaurants that "share" names with cartoon characters, like Pinocchio and Jumbo. While eating there is cheap, travelling to Macau will set you way back. 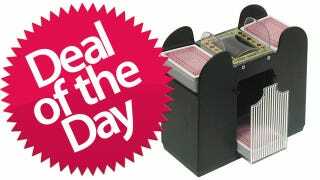 But at least you can always sit around at home with this card shuffler. It's much cheaper at barely ten bucks.